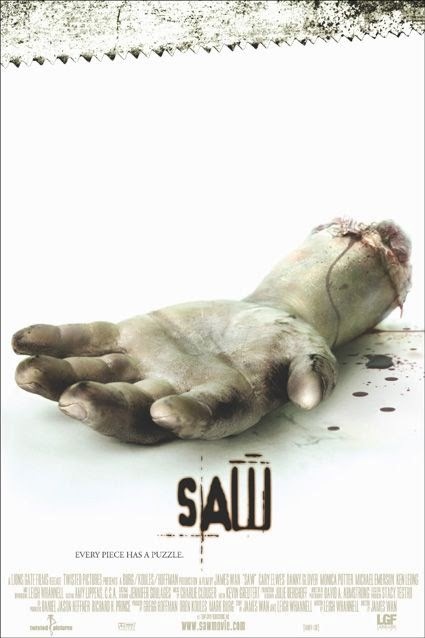 After waking up in a dark room chained to the walls, Dr. Lawrence Gordon (Carey Elwes) and Adam Faulkner-Stanheight (Leigh Whannell) have no idea what they are doing there or how they got there. A short time passes, and after some searching, they find some cassette tapes. The tapes contain messages for each of the men letting them know what they have to do in order to get out of their situation. These tapes are "the rules" of "the game." The rules are simple: Gordon must kill Adam in order to save himself and the lives of his wife and daughter, and Adam must stay alive and may have to kill Gordon in order to do it. You never expect it to end the way it does. It's an exceptionally gritty crime/thriller/horror movie, and it is genuinely scary because IT IS entirely possible to end up in a room fighting for your life at the hands of a crazy person. Jigsaw as a character seems to see himself on a moral high-ground, and the actions of putting his victims in their respective situations, playing these games, is somehow doing THE VICTIM a favor so they value their lives more. It's pretty genius the way this movie plays out, the way it makes you feel and look inside yourself to question if you would go to the lengths Jigsaw's victims do. It is graphic, but not nearly as graphic as some of its sequels (which are much less amazing). We like the fact that this movie doesn't boast a huge cast of huge stars, I think that would have taken away some of its "oomph." Then again, this is typical of James Wan, to not use the biggest named stars in Hollywood. Don't watch this before bed, if you value your sleep. It's one that will keep you up for a night or two because you can't get over how good it is. PS: This movie has a bitchin' score!